HTC launched their flagship device i.e. HTC 10 in May 2016 which received some great reviews, yet failed to alter HTC fortunes. The company is already working on it’s successor i.e HTC 11 (name is still a speculation) and even though we are at least six month away from any possible official launch considering HTC 10 launch in May 16, we have started to hear rumors about HTC upcoming flagship. The latest rumor originates from Chinese social network Weibo from a user, who got a decent record when it comes to leaks & rumors. 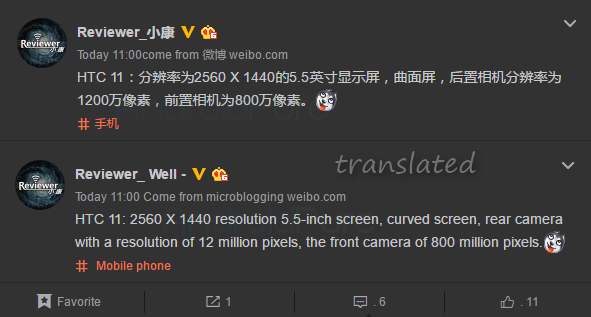 The rumor indicates that HTC 11 may be coming with a 5.5 inch QHD curved display with resolution of 1440 x 2560 pixels, similar to many flagship devices these days coming with dual curved edge display. This if true, marks an increase in display size from HTC 10, which comes with 5.2 inch QHD display. The rumor also indicates that HTC 11 may come with 12 MP main rear camera and a 8 MP front shooter for selfies. If you remember, HTC 10 also comes with 12 MP main camera, so we may assume a better sensor with better features in camera of HTC 11 if it comes with 12 MP. The front camera of HTC 10 though is 5 MP instead of 8 MP. The rumor indicates no dual camera setup which many of us have started to expect with any upcoming flagship device. At the moment, we do not have much details about the camera sensors or anything else including the CPU, Battery capacity etc. As this is just a rumor without any credible backup, take this with a handful of salt. Stay tuned at Androidpure and we will keep you updated.